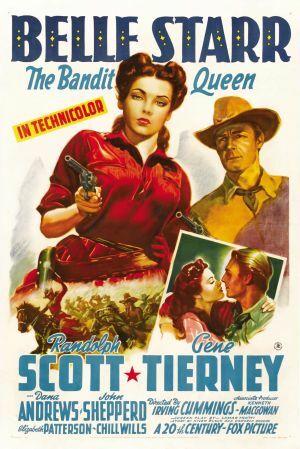 Early in her career, the beautiful Gene Tierney appeared in three westerns among her first four films: The Return of Frank James (1940), with Henry Fonda, Hudson’s Bay (1941) with Paul Muni, and this, with Randolph Scott and Dana Andrews. Although they were all based on historical persons or events, they had precious little historical accuracy in them. 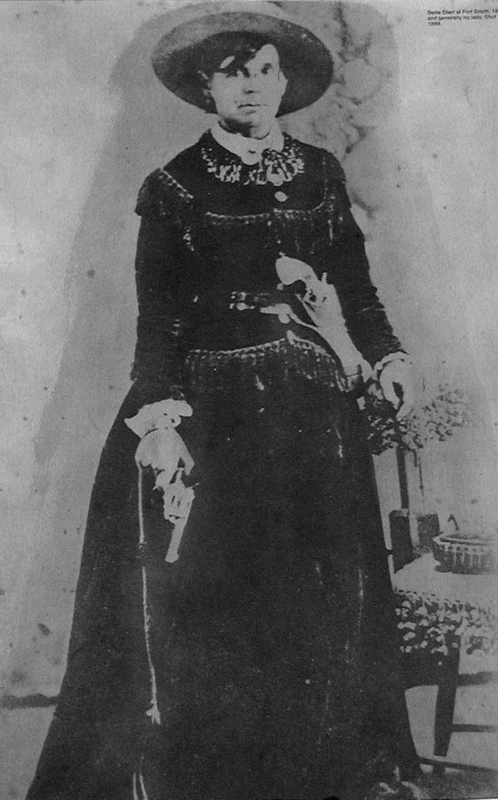 In particular, this depiction of the west’s most famous female outlaw has almost nothing to do with the historical person, playing her as a kind of Scarlett O’Hara in Missouri after the Civil War. 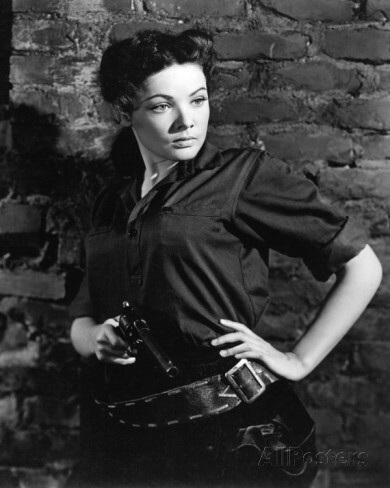 Scarlett, er, Belle Shirley (Gene Tierney), is a Confederate sympathizer with a lot of unused feistiness as the war ends. We see the family home as a large-scale southern plantation, which was probably pretty rare in Missouri. 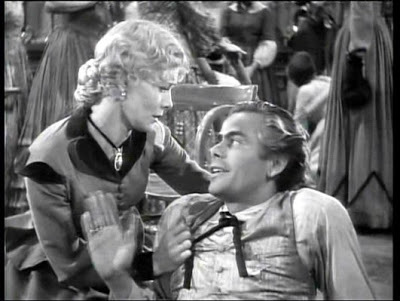 She shows her canniness by tricking ne’er-do-well thief Jasper Tench (Olin Howland) out of a stolen horse. Her brother Edward (Shepperd Strudwick) returns from the war, as does former romantic interest Thomas Crail (Dana Andrews), now a major in the Union army and the regional military authority. Crail is seeking former Missouri border guerillas who have not surrendered, such as Sam Starr (Randolph Scott). 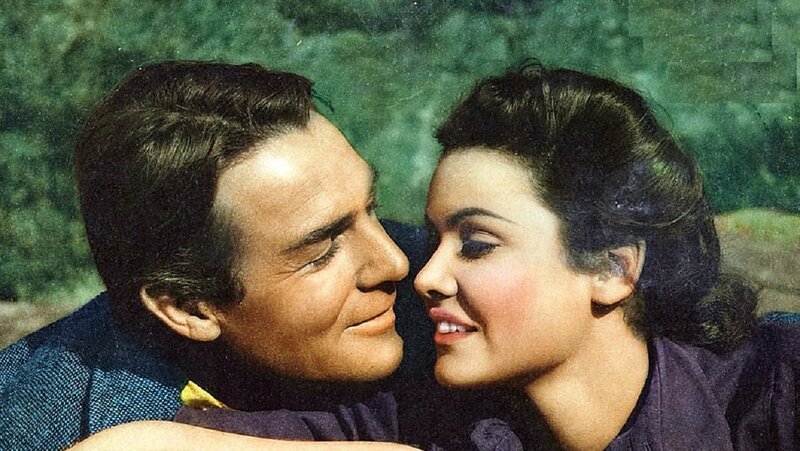 Outlaw Sam Starr (Randolph Scott) and southern sympathizer Belle Shirley (Gene Tierney) seem to be getting along well. Belle helps Starr escape Crail’s clutches, and Crail is obliged by the occupation rules to burn down her mansion. She flees to join Starr’s rebellion, and they fall in love and are married. Meanwhile, Starr’s rebellion continues to grow in size. Among the new recruits are the Cole brothers from Texas, said to have ridden with Quantrill during the war. The Coles have fewer scruples than Starr, and they influence him to move more in the direction of robbery and murder. Belle’s brother Edward comes to warn her about these new activities of Starr’s, and the Coles gun him down. Belle gives back Starr’s ring and leaves. Meanwhile, Starr plans to show up at a speech of the carpetbagger governor as a show of strength. Belle discovers that it is a trap, with Crail’s men waiting for Starr, and she rides to warn him. As she does, she is shot from ambush by Tench for the reward on her head. The shot is taken as a warning by Starr, and the raid is aborted. But Starr gives himself up when he hears about Belle’s fate. He and Belle’s mammy (Louise Beavers) see the body, but claim that it is not Belle so the venal Tench won’t get the reward. Crail knows as well as they do that the body is Belle’s, but he plays along. Gene Tierney as Belle Starr; and the real Belle Starr in a full-length studio portrait probably taken in Fort Smith, Arkansas, in the early 1880s. Tierney had marvelous facial bone structure and extraordinary beauty, but she was not a great actress and this is not her best work. (See Laura, The Ghost and Mrs. Muir and perhaps Leave Her to Heaven for that.) The writing makes Belle often seem angrily stupid, and the whole thing makes little sense. Scott and Andrews are good enough, and Chill Wills makes an early appearance as the outlaw Blue Duck (a strangely religious outlaw), otherwise best known on film as the principal villain in Lonesome Dove. But none of the characters in this film bear much resemblance to their historical counterparts. 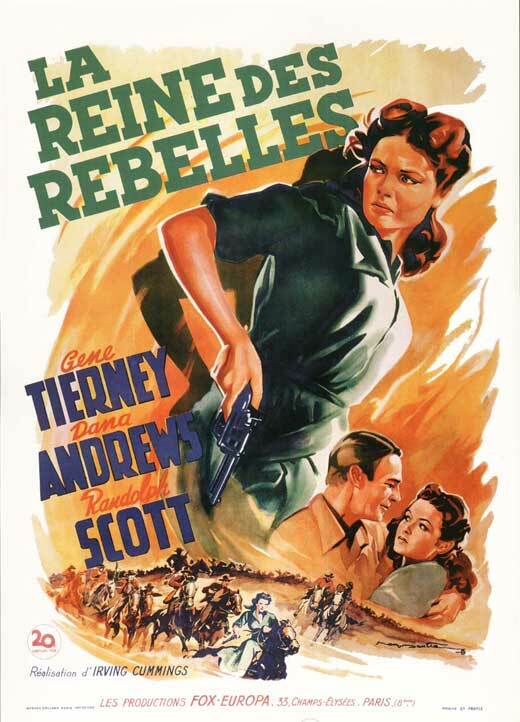 The film has distinguished writing credits, with a screenplay by Lamar Trotti (Young Mr. Lincoln, Drums Along the Mohawk, The Ox-Bow Incident, Yellow Sky) and story by Niven Busch (Duel in the Sun, Pursued, The Furies). It just goes to show that otherwise good writers can come up with an occasional bomb. Director Irving Cummings had been an actor from the earliest days of the movies, but was not terribly notable as a director, having done a number of unremarkable films, along with uncredited work on 1939’s Jesse James. 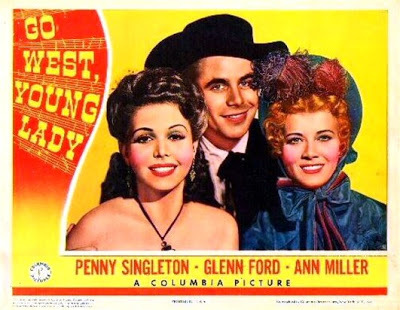 Music is by experienced movie composer Alfred Newman; the title music had been composed for John Ford’s Young Mr. Lincoln two years earlier. The film was shot in color (so it had a good budget for 1941), at the Iverson Ranch in Chatsworth, California, at 87 minutes. For a much more interesting depiction of Belle Starr on film, see Pamela Reed in Walter Hill’s The Long Riders (1980). 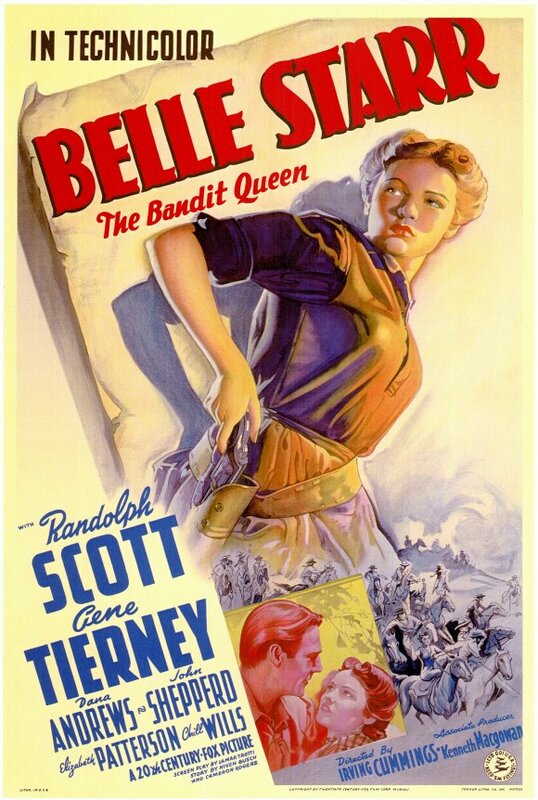 Although the real Belle Starr was ugly as a mud fence, she has been played on film not only by the glamorous Tierney, but also by Jane Russell, Elsa Martinelli and Elizabeth Montgomery, among others–usually in highly fictionalized form. This entry was posted in More Westerns and tagged Civil War Aftermath, Dana Andrews, Randolph Scott on November 20, 2015 by Nicholas Chennault. In the opening scenes of this late Joel McCrea cattle drive story, John Cord (McCrea) is being dragged through the streets of Hamilton by irate citizens as, bit by bit, his backstory emerges. He has been just let out of Yuma Territorial Prison in Arizona after serving a five-year sentence. An experienced trail boss, his men had gotten out of control and trashed Hamilton, resulting in extensive property destruction and a few deaths. Cord himself had ended it in a brawl with local cattle baron Ralph Hamilton (Don Haggerty), from which Hamilton had emerged blind but married to Cord’s one-time fiancée Janice (Phyllis Coates) after Cord had been sent off to prison. Now Hamilton has sent for Cord for his trail boss skills, at a time when Cord has few other choices. The town has never recovered and is on the verge of blowing away in a drought. Hamilton thinks Cord is tough enough to get a combined local herd of 4000 cattle to market at Ft. Clemson, at a time when water is even harder than usual to find. They have to get there first to win an army contract. There’s also a rival herd managed by another cattle baron Garth (Richard Shannon), which Cord also agrees to lead. It’s not clear what Cord’s game is, other than various unresolved feelings of revenge—against Ralph Hamilton, Janice Hamilton and various of the townsfolk. Aside from Ralph Hamilton, the only citizens who treat Cord decently are the aging brothers George Washington Jeffrey (Hal K. Dawson) and Thomas Jefferson Jeffrey (Paul Brinegar), who join the trail drive along with G.W.’s granddaughter Sandy (Gloria Talbott) and a number of other more or less resentful cattlemen. John Cord (Joel McCrea) drinks with the Jeffrey brothers (Hal Dawson and Paul Brinegar), two of the few friends he has left in town. As matters get sorted out, Cord drops out of Garth’s drive, telling him to head for Horsethief Creek because there’s no water at the Dismal River. Garth suspects that Cord is now trying to distract him and heads for the Dismal; in fact, Cord has been straight with Garth and is taking the Hamilton herd to Horsethief Creek. Slowly relations with the Hamiltons and the townsfolk develop. Hamilton offers Cord his ranch and cattle empire (and even Janice, by implication) for getting them through. Janice in some ways regrets her faithlessness to Cord, and it is unclear how far matters between them go before the ultimate resolution. It looks like they go quite a way, which was unusual for both a 1950s western and for a Joel McCrea character. Sandy evinces some romantic interest in Cord, even though he seems significantly too old for her. Needless to say, Cord gets the herd through. [Spoilers follow.] But Garth, thinking Cord was trying to slow down his herd, went to the DIsmal River and lost his herd. He has now hired gunhands to take away the Hamilton herd at Indian Pass, before they can get to Fort Clemson. Ralph Hamilton confesses that five years ago, when Cord beat his herd to market, it was he who had turned Cord’s hands loose on the town and started the fight with Cord. Now Cord has to save the herd from Garth’s gunmen and shoot it out in traditional fashion with Garth himself. As he leaves, it seems that rather than taking Ralph’s offer Cord will head for new ground in the northwest… and will come back for Sandy. It takes a tough trail boss (Joel McCrea) to get the herd to market. 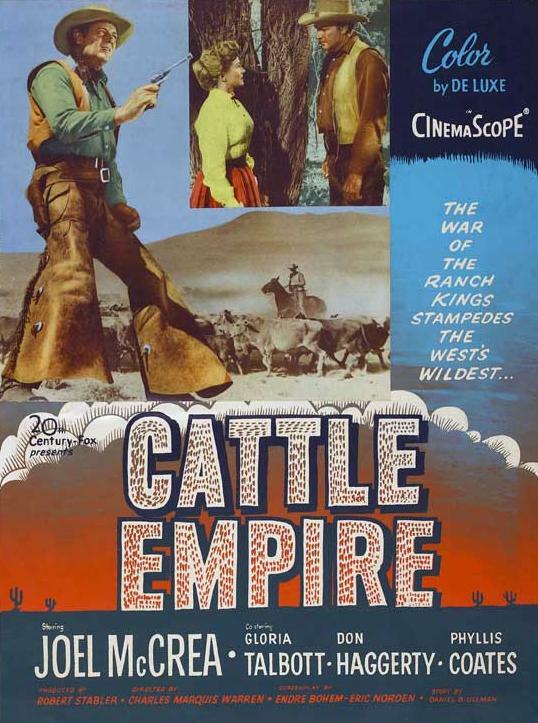 Director Charles Marquis Warren was known more for his screenwriting than for his directorial abilities, although he did direct a few other westerns, of which Trooper Hook (also starring McCrea) and 1956’s Tension at Table Rock (with Richard Egan) are probably the best. He then moved almost entirely into television work. That this is worth watching at all is due almost entirely to Joel McCrea, who’s a little more morally evasive than normal for him; otherwise the writing is undistinguished and the acting (other than McCrea) is unremarkable. The romantic triangle between McCrea, Coates and Talbott is interesting but seems at least partially unresolved. As noted before, the McCrea-Talbott age difference is obviously significant, but, like Gary Cooper and John Wayne, Joel McCrea could make it work out believably. The story seems unbalanced, with a lot of development of the various Cord-Hamilton-citizenry resentments and motivations and not enough of the actual arduous drive. It might have benefited from another 12-20 minutes of cattle drive, if it was done well. The film obviously utilizes a lot of stock footage during the cattle drive. The geography of the film is a little hazy. Cord had been in prison at Yuma, making it seem like Arizona Territory. But there are also references to the Staked Plains and to arriving at the Pecos, which sounds like maybe Texas-New Mexico. Fort Clemson, the ultimate destination of the drive, is apparently fictional. Fans of cattle drive westerns will note that there are several of the standard vicissitudes of trail drives missing here: no stampedes with related deaths, no bad storms and bad weather interludes, no Indian raids and such. That’s one reason the drive itself seems a bit light. McCrea gives a speech about how the hardest part of the drive is coming up between them and Horsethief Creek, and, with the next scene cut, the herd’s at Horsethief Creek without any of the hard going. It’s not the best of late McCrea westerns, but he makes it worth watching. Not to be confused with Cattle Drive, another McCrea cattle drive western from earlier in the 1950s. For the greatest of cattle drive westerns, see Lonesome Dove and Red River. Shot in color in the Alabama Hills around Lone Pine, at 83 minutes. This is not often seen these days, since it’s not available on DVD in the United States. 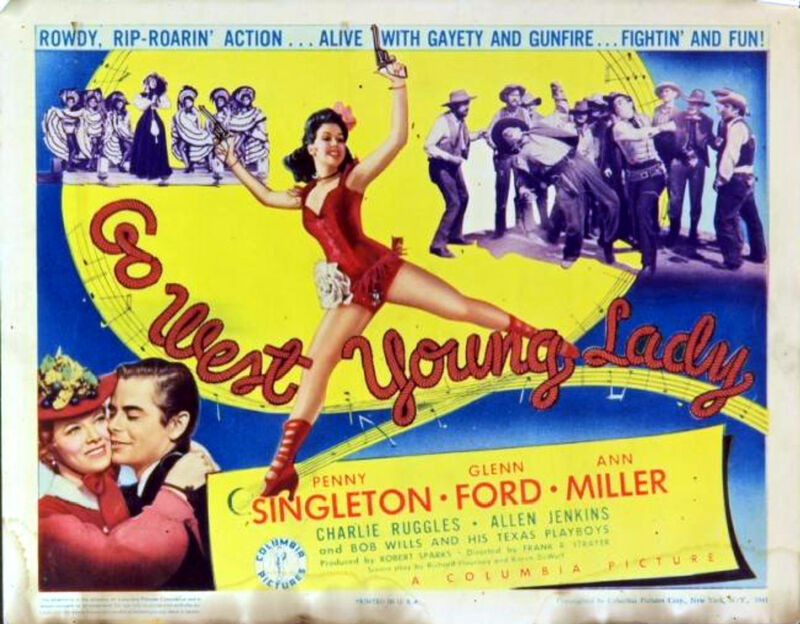 The year following this film, three members of the cast (Paul Brinegar, Steve Raines and Rocky Shahan) joined the television trail drive western Rawhide, with Eric Fleming as trail boss Gill Favor, a young Clint Eastwood as segundo Rowdy Yates, and writer-producer Charles Marquis Warren in control of the series. 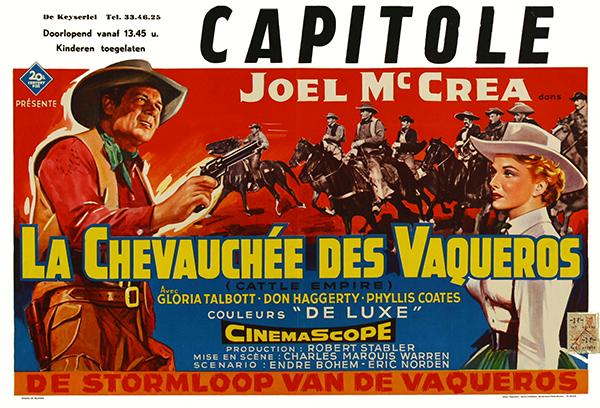 This entry was posted in Westerns Worth Watching and tagged Cattle Drives, Joel McCrea on November 1, 2015 by Nicholas Chennault.